Title page of Account of the Institution and Progress of the Society of the Antiquaries of Scotland. The title page of William Creech's 1782 printing of Account of the Institution and Progress of the Society of the Antiquaries of Scotland. Smellie, William. 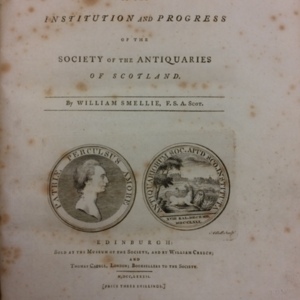 Account of the Institution and Progress of the Society of the Antiquaries of Scotland. William Creech, 1782. William Creech, “Title page of Account of the Institution and Progress of the Society of the Antiquaries of Scotland.,” UVic Libraries Omeka Classic, accessed April 21, 2019, http://omeka.library.uvic.ca/items/show/1408.